<Hero>! Welcome to our in-game convention! 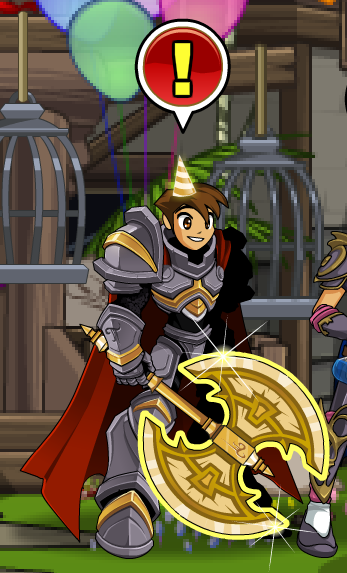 I am so glad you are here to help us celebrate Artix Entertainment's 11th anniversary, and AQWorlds' 5th birthday! I cannot wait show you everything we have set up, but before we can get our BattleCon on… we have to take out the Con-crashers threatening to shut it down! I love going to conventions, so I explore as much as I can. Because YOU are here to hang out with this year, I buffed my Dex and End before coming. I can move FAST and will not have to stop until it Con ends! This is going to be one of the best conventions ever! Greetings, Hero! Slaying undead is the best way to spend a birthday… but freeing a trapped spirit is even BETTER! We need your help to lift the Curse of the Phantom Pixel to free Yurei and let her travel into the next world. 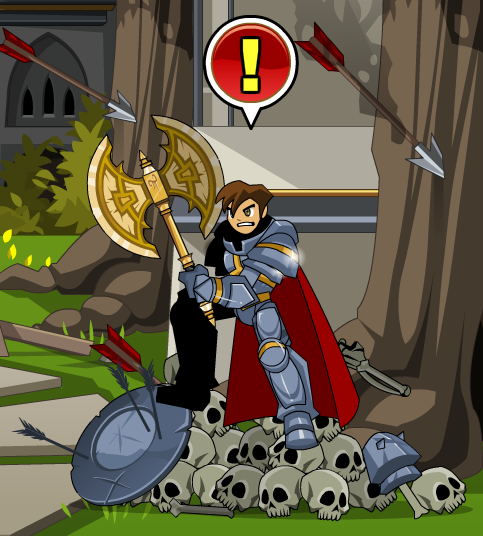 To do that, you will need to find 13 cursed artifacts across our 7 games… and 7 of them are in AQWorlds! Click the "Curse of the Phantom Pixel" button below to find out how to participate in our all-game cursed artifact scavenger hunt! Collect the artifacts in all 7 of our games to free Yurei and unlock the ultimate prize! Complete the event and link your game accounts on the Portal to unlock the OmniKnight Blade in all 7 games! Find all the details on the Curse of the Phantom Pixel event page! Greetings! I am glad to C you so # today. An unknown enemy has rewritten the game's combat engine, weaponizing the humor we love most. Waves of wea-PUN-ized enemies are headed to Battleon right now, but they have PUNderestimated us! We will fight back against this onslaught of PUN-ishment! We must regain control of the combat engine. The doorway into the server lies inside the computer in Cysero's Forge. Yes. Puns. I am always ready to charge into battle wielding my axe and enough puns to give a nekomancer a HISSS-yfit. So this. This HURTS. There are 10 kinds of enemies in the world: those who understand binary, and those who don't. Our attacker is most CERTAINLY the second kind. He, she, or it has found a way to insert wea-PUN-ized monsters into our world, and is sending them at us. Cysero has a computer, a rubber ducky, four walls he continually shatters, then rebuilds. And a chickencow. The rest changes without notice… usually. This year, his shape will not stop changing, and it is affecting heroes in AdventureQuest 3D. Thank you to all of you who were so passionate about having the statue in Batlleon change to honor Daimyo. it is heartwarming to see the fountain now has a statue of our very own symbol of loyalty, hope and extreme moonlight undead-slaying. Today is the start of brand-new holiday… Wishing Day. On this day next year, a very special thing will happen, just as today everyone can go to the fountain and get the Daimyo statue to place in your house and members can get the Daimyo pet. Greetings, Hero! 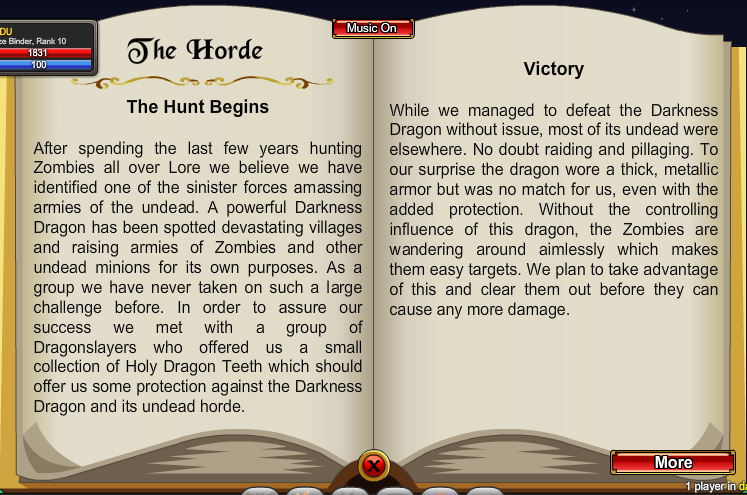 Lore is FULL of undead, and I have just head that massive armies of Evil Undead have invaded Swordhaven! Join me and together we will defend King Alteon and defeat the undead…. for Good! Welcome to your 10th Anniversary party, Hero! We are all here to celebrate 10 years of your epic achievements, victories, and adventures. We would not be here without you, our guest of honor! Keep up to date with everything happening in AQ3D, AQWorlds, and all our Artix Entertainment games. Welcome to the video and panel room! There is so much we want to show you: videos of the team and the crazy things we do, awesome fan-made trailers and videos, a question and answer sessions with the team, and live-draw sessions where our artists will draw what you want as you watch! New things will happen all the time, so keep checking the schedule! - Return to Back to the Con! Greetings, <Hero>. It is a good thing you have shown up here. This temple is home to one of the biggest zombie hordes that was ever exited and I get to slay them all! I may need a little bit of help getting through the temple and actually finding the Chainsaw Katana. But after that I get to go on a supper slaying spree all on my own. What exactly is the Chainsaw Katana, you ask? I do not know much about it… except that it is one of the most potent undead slaying weapons ever created. Plus it is a katana with chainsaw teeth spinning around it. How could I not add that to my collection! There are a lot of legend about it but no one has… successfully… claimed it before now. It looks like it is a zombie dragon that is leading this horde! According to the journal the Darkness dragon had a spell ready to re-animate himself as a zombie just in case the was slain. This could be a challenge, especially if we do not find the Chainsaw Katana before we find him! This Chainsaw Katana is amazing. I have manage to figure out that it runs on magic, not fuel. It is a huge relief really. I cannot think of how many times I would have been a pile of chewed up bones if my weapon had just run out of power mid-battle. Thanks for helping me get my hands on it. You can stay and read up on the Zombie slayers who fell here. Sepulchure's army of undead has overrun the city! They are dropping these bone heads down from his flying castle. It is up to us to stop them! We must protect the people of this city! My friend, I do not like to request this, but you must defeat Knight Captain Rolith in Swordhaven before we can fight further in this war. 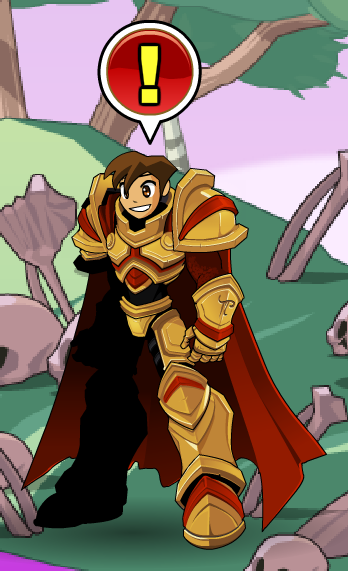 He must not be allowed to lead the zombie horde to Battleon! Galanoth's zombified dragons AND a legion of Zombie Villagers are swarming us. We will need to focus on the matters at hand, my friend, so we should deal with these undead FAST! 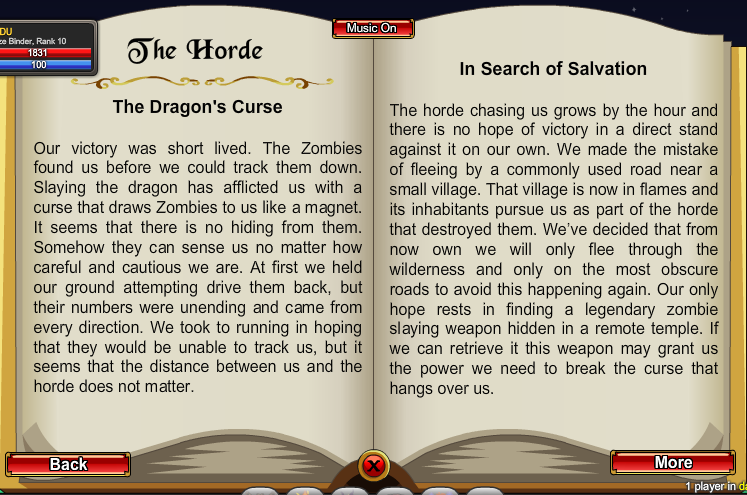 My friend, the zombies have overrun Battleon, but we still must have hope! There is still battling to be done, and Lore to save. With you by my side, I know we can defeat the forces we face. If you are ready to continue our quest, click on the "Keep Battling!" button below. Sepulchure's zombie fog has spread throughout Lore. There is no town left untouched. We are the last remaining haven, my friend, and we have innocent people who are counting on us to save them. We must defend this war camp with our lives! In the name of Good, for Lore, we must BATTLE ON! Hero, we have won! Everything is returned to normal. 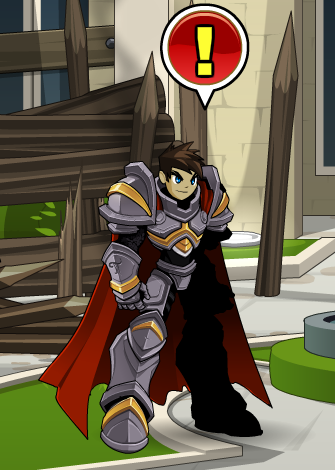 Our friends are alive again, King Alteon sits the throne of Swordhaven once more, and Gravelyn… is still the Champion of Light. We live in interesting times, my friend. I cannot wait to battle by your side through the next world-changing event with you! Battle on! I know that I am Rolith's best man but… but… I REALLY need to take care of these undead! What if they…? No, you are right. I need to get to the wedding and stand by my friend. It is a real honor to be asked to be his best man. You go on ahead, I will just finish up these last few waves and be on my way. Do not worry, hero. I will not let Rolith and Alina down. I am SO glad I found you! Captain Rhubarb is in trouble - he really needs our help! Let me know when you are ready, and I will take you to him. We have managed to track Gorgorath to her lair - here, in the wasteland where dragons go to die, she has built a castle from their bones. This time, we will all work together to defeat her - we cannot lose! Come on, friend! We will show that dragon that she cannot threaten Lore while WE are guarding it! She might be able to beat us when we are divided, but if we ﬁght her together she will not stand a chance! I have never had so much fun! Slaying an undead dragon with my good friend, Galanoth - and you, too! We will have to do this again sometime. Greetings! We have a lot of work to do if we are going to find all seven Z Crystals! Starswords are forged from highly-refined DragonStar Crystals. Other materials may be used to give them unique qualities, but each Starsword relies on its compressed crystal core for power. Remember to treasure your Starswords well! In order to find the DragonStar Crystals, you will need to use the map you just received. 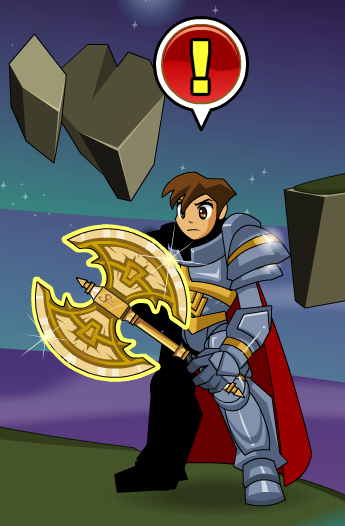 Equip your DragonStar map (in your inventory - it’s a mace) and click on it to open the map. You will see the Dragon Star Radar in the top left - move the magnifying glass over the map - when it turns green you’ve found the DragonStar Crystal location! Click, and you will be taken right there! You MUST do this in this map in order to finish the quest. All 7 DragonStar Crystals have been located, but your task is not yet complete! You must battle along the Dragonroad! You have cleaned up the Magic Guu, but now you must save my friend Twig! Our quest may be over, but our work is not yet done! There are still many things to do! We have lost contact with the space station, Skylab Z! you are the only person I can trust to investigate it. It contains extremely dangerous TOP SECRET cargo. I am not the Artix you know… well, at least not yet. I am from the future! I am part of a secret order dedicated to protecting the universe. You are onboard the transforming starship, the Paladin. Hero! 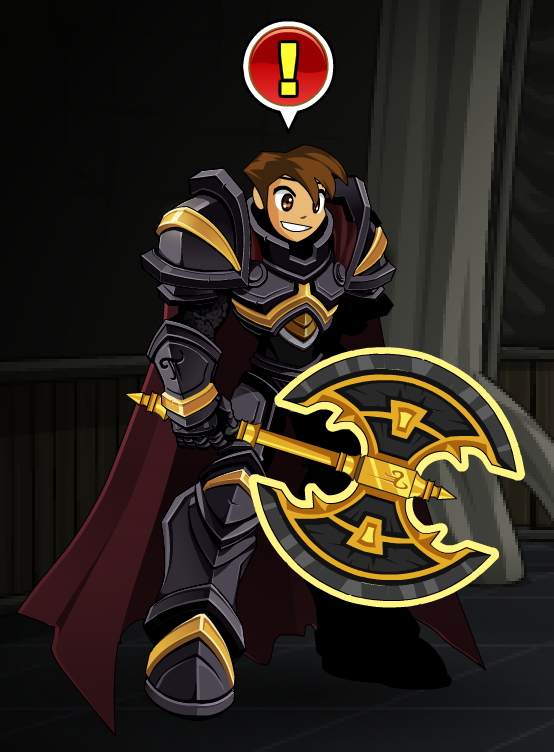 This paladin desperately calls upon your assistance to stop the ultimate source of EVIL! I know you are scared; we are all scared. But that does not mean we are cowards! Can you…lend…a…hand? We can take these Pink-ites, we can take 'em! Battle on! …pinkomancy… Beleen… skeletons were pink… SLIMES were pink… TOO PINK! TOO PINK!!! Great work so far, Hero. But now is not the time to halt. More nightmarish minions have appeared… and they seem even more powerful. Where do they keep coming from? Who is the leader? There is only one way to find out… Onwards into battle! Hero! Over three millions Terrorkind have fallen victim to the valiant efforts put forth by you and your fellow adventurers! But this war is not over yet. Head back to the battlegrounds and eliminate any straggling minions… including the monstrous otherworldy War Boss, the Fear Feeder! Battle on! A new threat has presented itself to the world of Lore. They are called Terrorkind, a race of monstrous beasts deriving from an unknown dimension… a dimension comprised of fear! And if it was not bad enough, their numbers just keep on growing too. The Terrorkind must be stopped. If we can thin their ranks… perhaps we can get some answers as to who… or what… is behind this onslaught. Battle on my friend! The Dread Werepyre Lich, Kurok Gravefang, is close to finding Death's Hourglass! You must defeat him in one-on-one combat and drive him out of Northpointe, or Yurei will never be saved from the Curse of the Phantom Pixel! I am ready in case you need back up, but I believe in you… and that you can defeat him single-handedly! I am glad you were able to slow this monster down, but it is still headed this way! 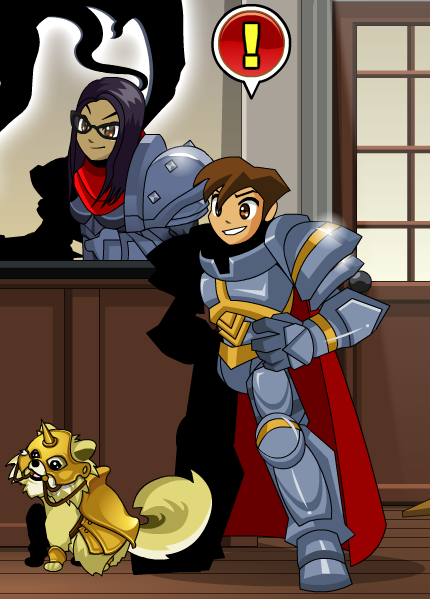 Cysero and I are doing our best to make sure Battleon is protected as well as it can be. We are planning to evacuate its citizens, but still… it would be nice to have a home to come back to. 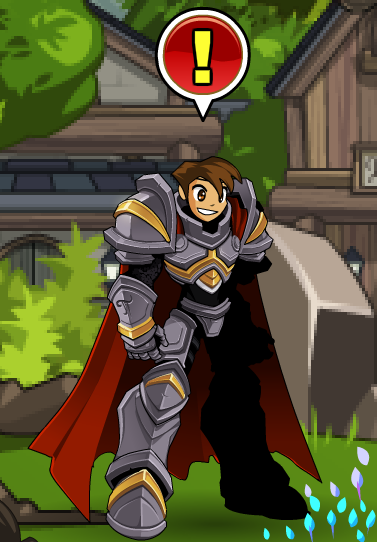 The plan is to fight Extriki in Greenguard, so that Battleon will not take the brunt of the damage. But we still have to be prepared for some flooding. Thank you for all your help! Gravelyn has asked me to send you back to the Charred Path. There is something she needs your help with! Hero, we must hurry to save whoever is screaming or we are going to miss the start of the Voltaire's concert! I am so glad you are here; with you battling alongside me, I know we will not fail that girl… or miss the opening act! You have been a part of my life for so long… but the real-life wedding chapel could not hold hundreds of thousands of Heroes… so we built this in-game wedding so you could attend! Thank you for sharing this special day with me and Michelle! You should be at the wedding reception, Hero! You do not want to miss all of the fun! You have no seen Cysero /dance yet, have you?! Greetings and salutations! I see you would like to train as a Paladin? Paladins are knights who defend all that is good in the world, while at the same time defeating evil, dark and undead forces wherever they may be found. As a Paladin you will fight, defend and heal. 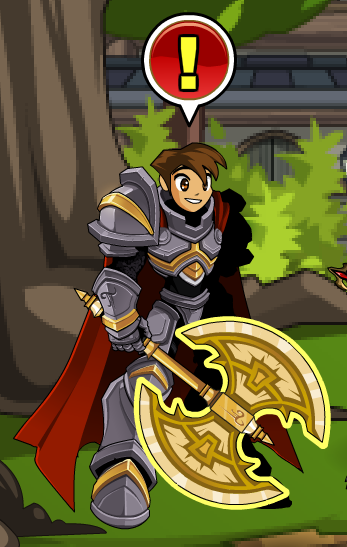 Although to pass you on my knowledge as a Paladin you will need to be a Warrior Level 10 and a Healer Level 10. 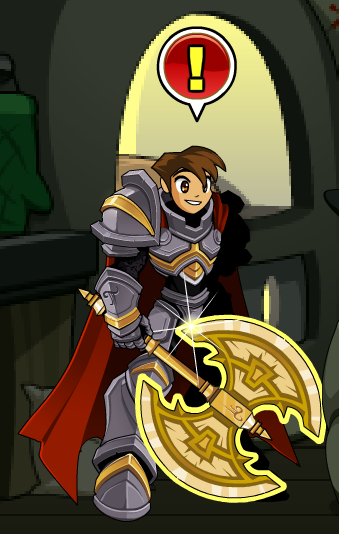 Note: Only appears in Light Temple once you have beaten the Help Artix in Swordhavenundead quest. This is the bottom of the Temple of Light. *whispers* If you have not explored the rest of it yet, you should return in the future! There are so many undead to slay! But right now, we need to get Warlic his Dracolich bones! This will be a dangerous fight, bur I KNOW we can win! That was a BRILLIANT battle! (It needed to be; it is very hard to see in all of this darkness!) But you need to take these bones to Warlic in Dragonhame before they lose their freshness! (Freshness is always important.) You go back to Warlic and Drakor… I will stay here in case the Dracolich rises again! Next Step: Speak with Warlic in Dragonhame. Greetings and salutations, Hero! Though you are probably just a figment of my imagination, I feel compelled to tell you that there is nothing I LOVE more than slaying the undead, as well as all things pink! Greetings friend! I am so glad you are here. It appears that a Necromancer has reactivated the Necropolis… *coughs* again… and you know what that means. 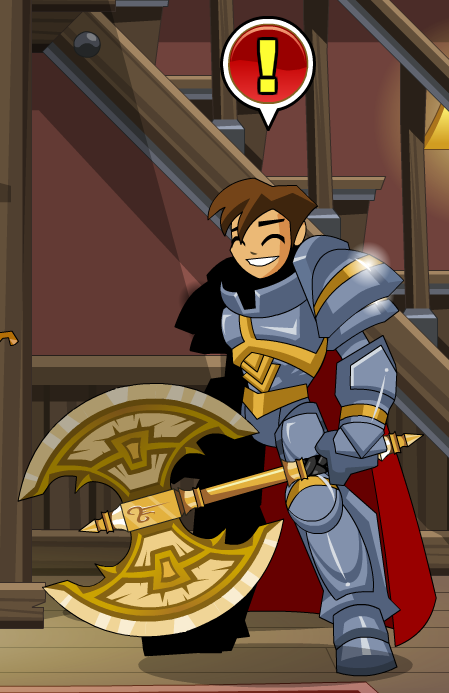 *super friendly smile* TIME TO BATTLE THE EVIL UNDEAD!!! Wow, we sure have been through a lot together! Seems like just yesterday we were saving the world from crazy necromancers, undead armies and lords of darkness. Well, I guess some things never change. I wonder what is going on at the bottom of the Necropolis… only one way to find out! Thanks goodness you are here! Bloodtooth the Dragon has kidnapped the Princess and is attacking the town of Battleon! Aye! This is a pretty tricky situation. If we shoot the dragon down, the Princess will fall too. 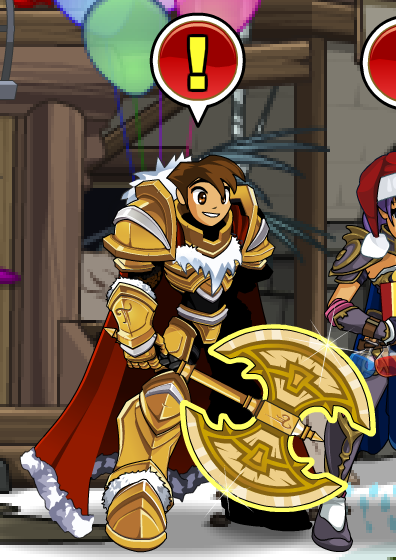 Artix, how can you smile at a time like this? This is serious! I just know we can win, Robina! First, we need a plan to get up there and rescue the Princess. AMAZING! Now that is how a real hero handles a desperate situation! Erm… by beating up a Princess and crashing a Dragon? LOL! She will be fine. All the hero did was destroy the cursed Ring of Dragon Control. I wonder what sort of reward the King will have? Greetings, my friend! It is hard to believe that you have been battling on Lore as long as you have… but here we stand! I am so grateful to you for all toy've done, and I hope you will be here for many years to come, battling alongside me, the AdventureQuest Qorlds development team, and the tens of thousands of other heroes in Lore, I have a few gifts to celebrate your time with us - click the Quest button below to begin… and BATTLE ON! Greetings, my friend! I can tell already you have the talent it takes to become one of the greatest heroes on Lore! To do that, use class skills in combat to rank up, unlock even more skills, and become more powerful. You can defeat monsters to earn gold, get new gear, level up, and earn reputation. Battle monsters to level up your class (called "ranking up") and unlock stronger skills. Some skills unlock special attacks or are used in combination with other skills. You can purchase classes in Battleon or earn them with reputation. 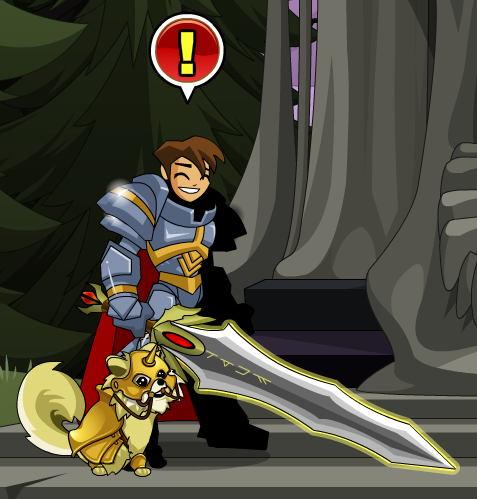 Certain classes like the BeastMaster summon pets to battle for you! You can find out more about combat from inside the Combat Practice area. Stryche is waiting for you there! That sewer stunk worse than Cysero's left sock collection! And I would know… *note to self: NEVER smell anything Cysero recommends…* It's much nicer here in the woods, but why is everything PINK???? Beleen is making her way north into the mountains… and from the looks of things, she wants to transform Citadel into… *ulp*… Citadorable! Pants or no pants… we must STOP her! Go to the citadel and looks for ANYTHING that seems out of the ordinary. If it's PINK… it's Beleen'd! HERO! Thank you SO MUCH for stopping Chaos Queen Beleen. But, uh, why am I still not wearing any pants, you ask?! 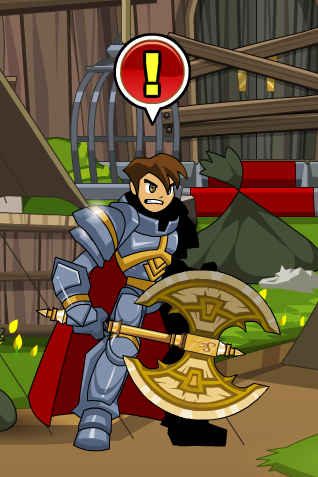 …Beleen turned my Red Cape into a Pink Cloak of Destruction, and it contaminated my Paladin Armor AGAIN. She does not need to have Chaos powers to still TORMENT ME!! AAGHHAGAAH! The time has come, my friend. You must face one of the greatest foes Lore has ever known. I know you will emerge victorious! Battle on! This sewer stinks worse than Cysero's left sock collection! And I would know… *note to self: NEVER smell anything Cysero recommends…* This is disgusting! Let's finish here quickly! This sewer stinks worse than Cysero's left sock collection! And I would know… *note to self: NEVER smell anything Cysero recommends…* Let's get out of here! Onwards, hero, to the Pinewood Forest! Greetings and salutations! I see you would like to train as a Paladin? 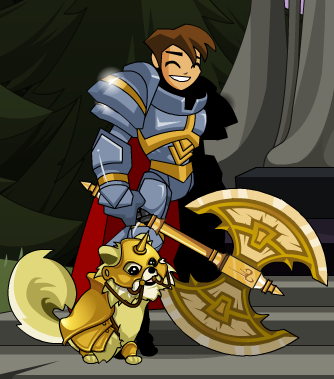 As a paladin you will fight, defend and heal against the evil, dark and undead forces of this world. In order to begin your training, you will need to be a Rank 10 Warrior and a Rank 10 Healer. Prove victorious in all my quests to become a Paladin! Paladins are knights who defend all that is good in the world, while at the same time defeating evil, dark and undead forces wherever they may be found. 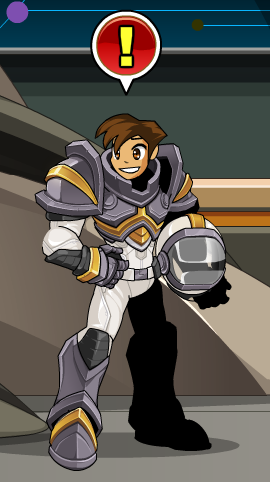 Although, to pass you on my knowledge as a Paladin, you will need to be a Warrior Level 10 and a Healer Level 10. Prove victorious in all my quests to become a Paladin! Becoming a Paladin requires a powerful body, mind and spirit. If you want to make the most of your skills you will need Enhancements that improve your Strength, Intellect, Dexterity and Endurance stats… like these Enchancements I have right here! My armor… Beleen's Chaos Power has contaminated it by turning it PINK! AGAIN! ARRRGH! Please, Hero, go to Drearia to stop her! I leave Swordhaven unattended for a few days to go into space… and what do I find when I get back: oh, just Beleen is now Chaotic and is infecting Swordhaven with *shudders* pinkness. I am powerless against pink, so I need YOUR help stopping her while Cysero helps me find some pants. That sewer stunk worse than Cysero's left sock collection! And I would know… *note to self: NEVER smell anything Cysero recommends…* Let's get out of here! Onwards, hero, to the Pinewood Forest! Sepulchure's army of the undead have overrun the city! They are dropping these bone heads down from his flying castle. It is up to us to stop them! We must protect the people of this city! They must be are throwing every undead soldier they have at us. (It feels like my birthday!) I will take care of the ones out here <big smile>. You must go inside to the castle and protect the King! All of the King's guards are in there -- there is NO WAY the undead could have gotten through their defenses yet. Battle on, friend! Quests Complete: Go north through the gate and into the Castle! My friend, welcome! 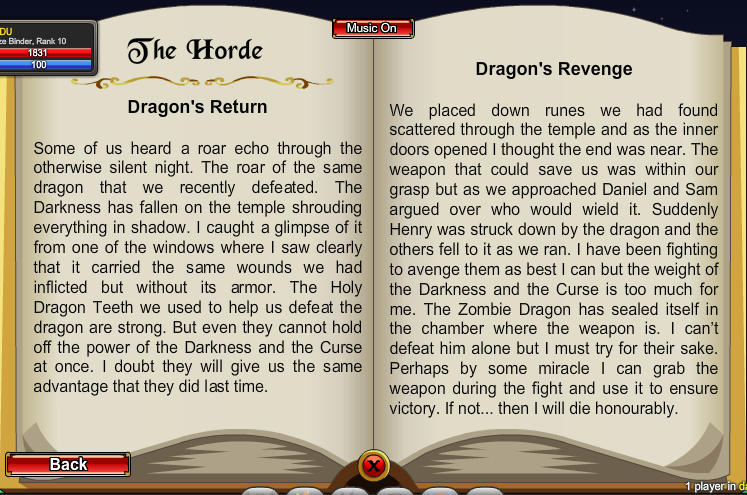 We are celebrating AdventureQuest Worlds' 8th birthday with the finale of the main storyline saga: Throne of Darkness! If you have not finished any of the chapters yet, click on the menu to the right. Yes! It is crazy, I know, but the AdventureQuest Worlds dev team has been creating and updating the game ever since October of 2008. We are so grateful to all of the heroes - new and old - who have battled alongside us on this adventure. Please, join us in the Secret Underground Lab and BattleCon as we celebrate! You want to be an ArchPaladin? AWESOME! We always need more Good heroes in the ranks. There are three different ways you can do that. 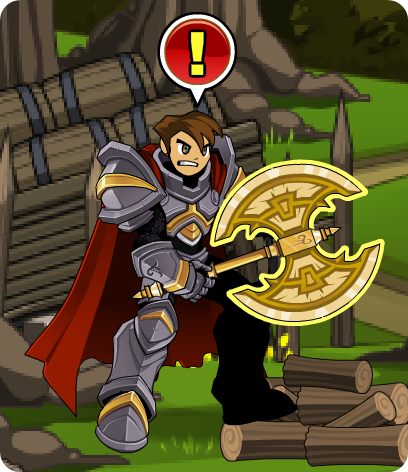 If you already have the Paladin class, click the first button below and start questing! If you do not, click the second button below to begin YOUR quests! Or… *whisper* you can buy the class for AdventureCoins. If this is anything like the other times, Hero, Alina and Rolith's prision is made up of solidified uncertainty and fear. They worry they will not have enough time to do what needs to be done. It is a prison they have created themselves, but trapped inside it, they cannot get free. You will need to help, and to do that, you will need to buy them Time. It is so good to see you, Hero! You have made your way even deeper into the Room of Gloom and found the Super Mega Ultra BrutalCorn. If you can defeat him, you will be granted the BattleCon VIP badge to show that you have helped save BattleCon from the Ultra BrutalCorn! You will be handsomely rewarded if you can complete this quest! It is so good to see you, Hero! Happy birthday, Hero! Thank you for saving Artix Entertainment from EbilCorp's Invasion. I knew they would not defeat us. Not when we have YOU fighting on our side! Now that our games are safe, it is time you started your tour of the Secret Underground Lab. Daimyo will show you around while I help the team get your birthday celebration ready! Four years ago, we released AdventureQuest Worlds. We had never made an MMO before, but we knew that if we never stopped trying our hardest, we could do it! And we know that with players like you fighting alongside us to make AQWorlds the best game it can be, we can do ANYTHING! Happy 4th birthday, Hero, we can not make this game without you! While you are hunting for BrutalCorn… want to help take care of some OTHER distractions? It will help us get our future releases out faster… unless MORE invaders arrive! 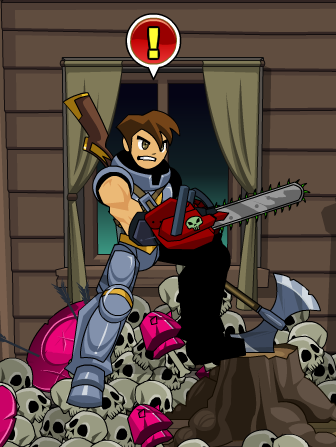 After I have finished a long battle, there is only one thing I like to do… grab my axe and slay Undead! But sometimes it is hard to wait, so I keep our spare practise Skeletons in the Server Closet. There are so many in there now it can be hard to get to the servers! Every hero - and gamer - needs a snack after testing new gear like that! We are going to need… GAMER FUEL! You have… the KEY to the ROOM OF GLOOM!?!?! Hero, what you hold in your hand could be the one thing we need to protect the Lab! No normal creature can enter the Room of Gloom and survive unharmed. But you are no normal Hero! I cannot thank you enough, Hero! Because of you and all your hard work, the Lab is saved! We really could not make our games without you. 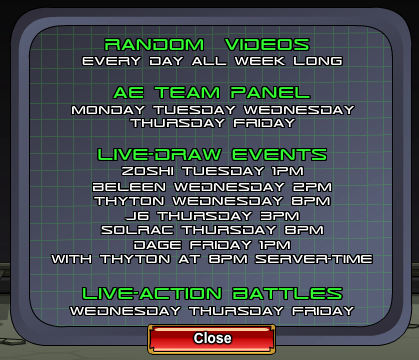 The entire team will get to work immediately… AFTER we celebrate AQWorlds' 5th birthday! A Lich is summoning an army of the undead to attack Battleon! We must defend the town by stopping them here. Battle the forces of the undead and keep your eyes open for defender prizes; as you get one, you can trade it in for equipment that will aid you in battle. Accept a quest and head into battle now, or choose to take on a more ferocious Lich if you are a more experienced Hero. Experienced Heroes (or those who want to become one) may choose to battle more ferocious versions of the Lich. Though they are often solitary creatures, during invasions like this, the Liches of Lore may band together to take out well-defended opponents, then argue over the spoils of war if they win. We will NOT let them win. A Lich is summoning an army of the undead to attack Battleon! We must defend the town by stopping them here. Battle the forces of the undead and turn in Defender's Medals to increase the war meter. Turn in Battle Prizes for special items. The Lich will reveal itself once we reach 100%. Battle on! Four years ago, we released AdventureQuest worlds. We had never made a an MMO before, but we knew that if we never stopped trying our hardest, we could do it! And we knew that with players like you fighting alongside us to make AQWorlds the best game it could be, we can do ANYTHING! Happy 4th birthday, Hero, we could not make this game without you! The Chunin is very powerful shadow warrior who uses massive strength to attack multiple enemies at once! Members and non-members can earn the class but only until the birthday event ends. After that you will only be able to buy the AC version until it goes rare next October! A vicious undead dragon! And she has an entire army of undead minions! I have not been this excited in years! I CAN NOT BELIEVE we let that dragon steal the Jewel of the Undying and escape! We have to find her! And when we do - we will all work together to defeat her! Meet this NPC in our free web game at www.AQ.com!